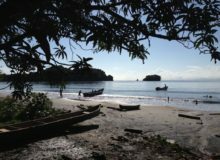 Discover the different cities in Nicaragua, their charm, their people and the different things to do. Lake Managua is one the Largest Lakes in Central America. Also known as Lake Xolotlan, the lake is adjacent to the city of Managua; making this city different from the rest of Central American capitals. Managua is only Central American capital that is next to a Lake. Lake Managua, also known by its pre Colombian name; Lake Xolotlan. Together with Lake Atitlan, in the Guatamalan highlands, it is the second largest lake in the region (they are both the same size, approximately 1050 square kilometers or 400 square miles). 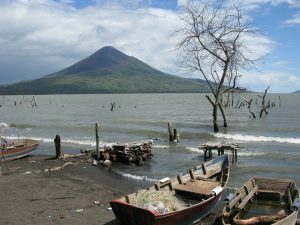 Second only to the huge Lake Nicaragua, to which it is interconnected by a short river, the Tipitapa that drains Lake Managua into Lake Nicaragua. 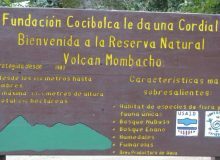 The most significant landmarks in the lake are the Momotombo Volcano whose peak reaches 1280 meters above sea level (4,200 feet). Momotombo sits on the northwestern shores of the lake. Another small volcano nearby forms an island, the island and volcano are known as Momotombito. Lake Managua sits at an average of 39 meters above sea level. The water level does fluctuate throughout the year, and can rise several meters during significant meteorological events, such as the passing of hurricanes or intense rainy seasons. The lake is relatively shallow, with an average depth of only 5 or 6 meters (20 feet) and a maximum depth of 20 meters, (65 feet). Over the years, the government of Nicaragua allowed all raw sewage from Managua to drain into the lake. This together with industrial discharge polluted the lake. It is therefore unsuitable to swim and be used for recreational purposes. This however, was not always the case. In the past, Lake Managua provided great fishing for the locals. Lake Managua was a transportation route, cutting distances from different communities. Travel from from Managua to Puerto Momotombo, located almost next to the ruins of Leon Viejo was an important route. The port town of San Francisco Libre, was part of a route between Managua to Sebaco, Esteli, Matagalpa and Jinotega. As such, Lake Managua served as an important means to transport goods between these cities, and the capital, Managua. 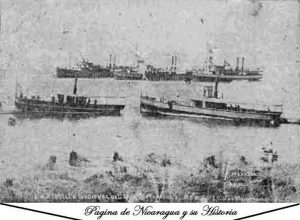 Historic photo with steamships at Lake Managua. Back in those days of glory, steamships used to provide service for both passengers and cargo. This made it easy to exchange goods between the different communities around the lake. The Steamships, the Amalia, Isabel, Progreso, Managua and Angela, proudly sailed the lake between the different ports over the passing of years. The most important route was that between Managua and Puerto Momotombo. This because this last port, adjacent to the Momotombo Volcano, was served by the railroad that connected the Corinto – Leon – Momotombo route. Thus, this was the easiest way to travel between Managua and Leon. 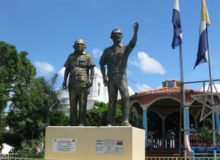 Records show that famous Nicaraguan writer, Ruben Dario traveled from Leon to Managua. 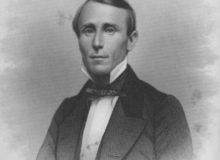 To do so he used the railroad from Leon to Port Momotombo and then took a steamship to Managua. 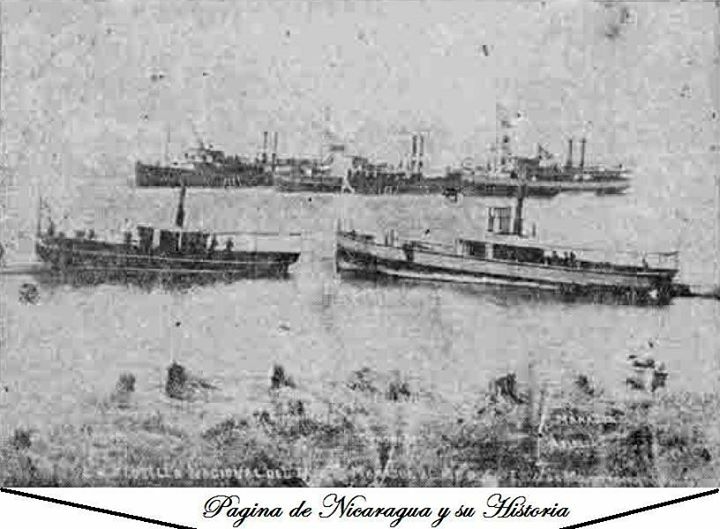 According to the records, the last passenger and cargo boat to navigate lake Managua was the “Chocoya”. 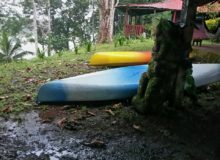 She was diesel powered wooden boat that traveled between Managua and San Francisco Libre, in the northern shores of Lake Managua. La Chocoya was at the service of the Catholic Church in San Francisco Libre. Her engine broke down when navigating during tropical storm Aletta, back in 1982. The ship floundered in the nearby shores of the Chiltepe Peninsula. La Chocoya was towed back to San Francisco Libre, where she was scrapped. This ended the era of cargo boats navigating Lake Managua. 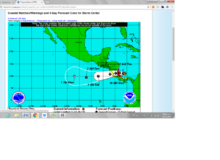 Today, Lake Managua has become a tourism attraction. The government of Nicaragua has built a nice board walk and port facility called Puerto Salvador Allende. The port is within the shores of Lake Managua near downtown Managua. Infrastructure was been built in other communities around the lake. Such as the case of Port Carlos Fonseca Amador in the town of San Francisco Libre. 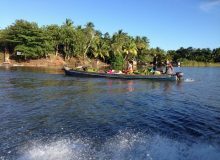 The passenger boat, “La Novia del Xolotlan” offers tours departing from Puerto Salvador Allende in Managua. Sailing though the lake, you can easily imagine the days when steamship travel was the way to travel between Leon and Managua. Life certainly had a slower more relaxed pace back in those days.